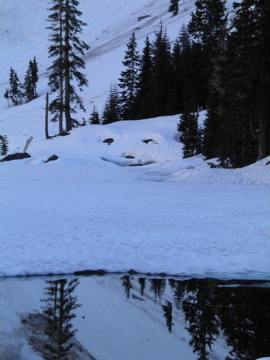 2'fer...Mason Lake and Bandera Mountain on the 4th of July! Exit 45. I-90. Yeah Baby! 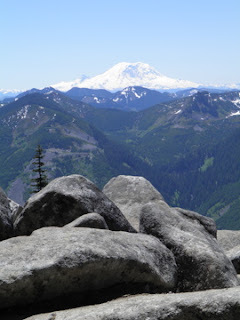 If you would like a challenging hike that is just as good if not better than Granite Mountain than this would be the one. 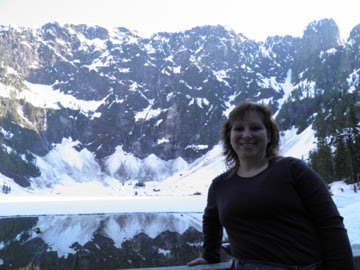 This has the best of both worlds, an alpine lake and an alpine mountaintop view from Mt. 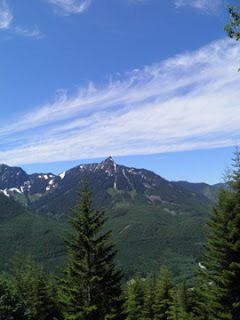 St. Helen's to the Olympic Mountains. Incredible to me. This is a very easy hike to get to by car as the trailhead parallels I-90 and 3 miles from exit 45. 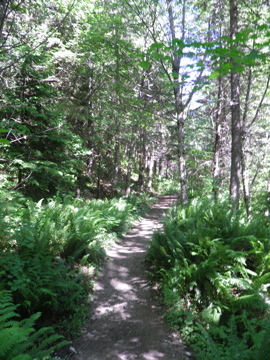 Like any sunny day in the Pacific NW, the trails that are most easily accessible are the ones that will be the busiest on days like this one. 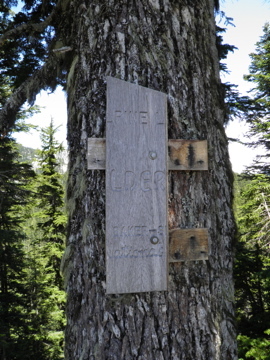 Although the more challenging the hike, the less novice and total amount of hikers will be on the trail which in turn makes the overall experience more enjoyable. 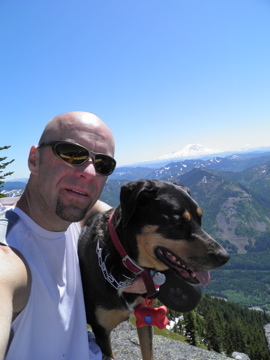 Miss Lucy and myself had a great time on this hike. It was a little warm for her as the hike up only offered up shade in short and sporadic spurts. 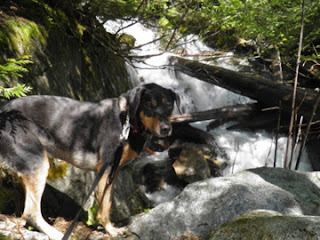 So we took our time, taking advantage of what shade there was and the few amount of water there was on the trail up until the ridgeline to Mason Lake. Snow was present once we passed the crest of the ridge going to Mason Lake so Lucy was in heaven! 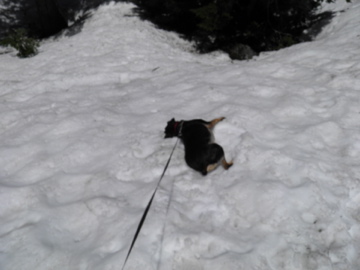 Not only was there shade but what Lucy loves...snow and especially water! 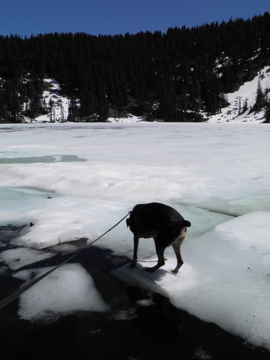 About a half mile down to the lake, there was still plenty of snow and postholing too. One step too close to a boulder led me to a step down almost to my hip. With the warmer temps this will occur more and more especially near rocks and boulders as they warm the snow will melt even faster. 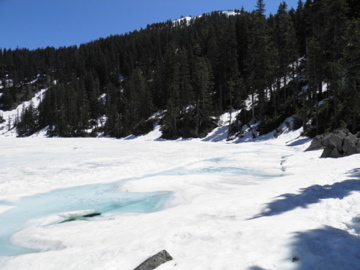 Mason Lake was still frozen for the most part except around the edges about 6' out from the shoreline. 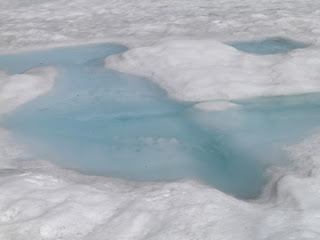 It will not be long and the ice will rapidly disappear. The dynamic of having one side of the mountain hot and dry then the other be cool and comfortable with snow is something that I really enjoy about the mountains. After both Lucy and I cooled off for a while we headed back to the trail junction to head up to the summit. 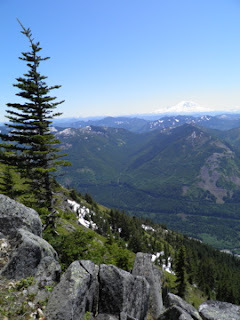 Great views all around heading back to the trail juntion as looking straight ahead will give a face full of Mt. Rainier. The higher you get the better the views and as we made our way to the top Mt. St. Helens came into view...at least the very top of it. What's great about it is that my brother, Isaiah and I will be climbing to the rim of St. Helens at the end of the month! Back to the task at hand, from the junction the trail ascend rapidly as the grade of the mountain becomes more true to what a mountain climb is...steep! There are great natural granite steps all the way to the plataeu but don't stop at there! Although great views here, the trail continues up through the alpine forest with a little snow that is left on the trail. Be careful here because the trail is sometimes hard to follow but as long as you are heading in an upward direction you will be just fine as the trail through the trees is not that long. Word to the wise...DO NOT venture out to the snow to your left!!! It is a cornice and if it breaks off you may not survive. Someone heeded my advice and went out about 10' with her boyfriend saying it was fine. My focused came back to the incredible views, peace filling my heart and spending a little time with my girl, Lucy. After we grabbed a small bite to eat we headed back down to the car. If you are crunched for time, as I kind of was, plan on taking pictures at the top and on the way down instead of on the way up and down. Keep a steady pace as you head to the summit. This way you know how much time is needed on the way down and can plan accordingly. 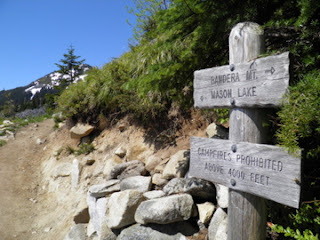 My advice...go to Mason Lake first as you may not have the motivation or energy to head there after the summit! Plan on a solid 4-6 hours on this hike. If you are able to...plan this hike around a sun-filled day. The views are incredible! Bring extra water, esp. 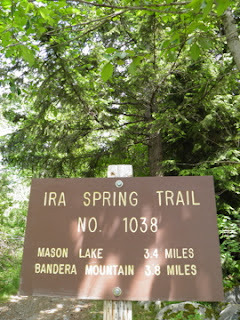 if you plan to skip the lake and only go to the summit. The trail faces the west and is very limited in shade and water. Great shot of the trail on the left and the fantastic view to the right. 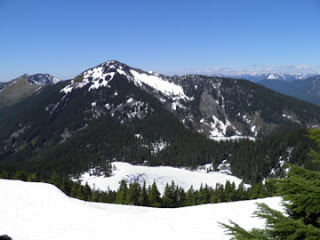 Mason Lake and the ridgeline of Bandera Mountain summit. The view before going over the ridge to Mason Lake. 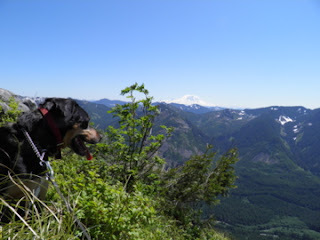 Lucy reminding me of a marmont I once saw at Rainier. I turn my head for one second and she jumps out to the ice! Looking south towards the summit of Bandera. The view to the top. 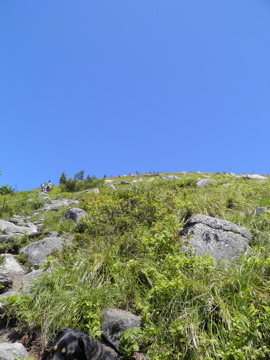 Notice the hikers on the way to the top! 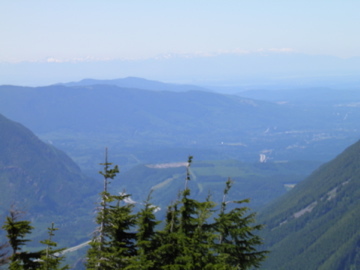 Looking north to Mason Lake and the North Cascades. Northwest view of the Olympic Mountains and a very faint downtown Seattle. 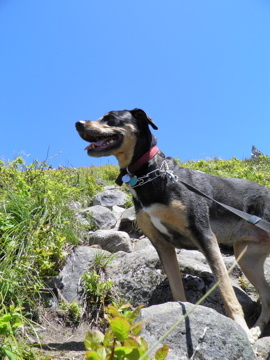 The very top of Mt. St. Helen's and Mt. Rainier. Lucy finding her spot to chill. On the way down overlooking the granite boulder field. Very nice beginning to the trail. Labels: Alpine Lake, Alpine Wilderness, Lucy, Mason Lake, Mt. Bandera, Mt. Rainier, Mt. St. Helens, ThaddeusD. 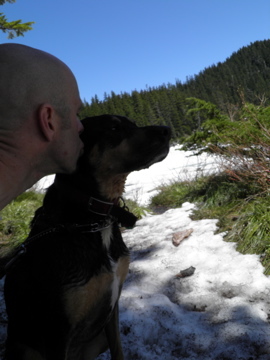 I apologize for the delay in the posting if Lake 22. Super busy lately and wanted to add a few more photos before I posted the blog...Enjoy! 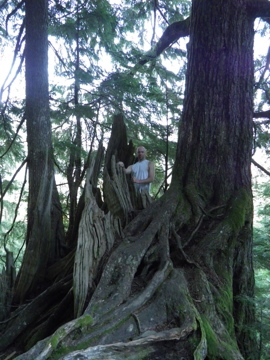 Just an amazing hike along the Mountain Loop Highway﻿. 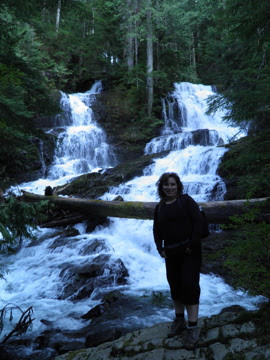 This hike almost has everything from waterfalls, old growth, snow, and an amazingly beautiful lake at your turn around point with Mt. 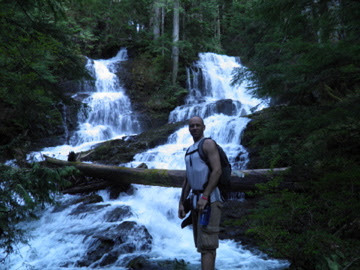 Pilchuck with around 20 waterfalls cascading down as the backdrop. This is an easy to access hike as it is right off the highway, which is very nice because most hikes with these many features typically require long drives on forest service road that are full of potholes and dust. The trailhead starts about 200 yards off the road and after a 1/2 mile of paralleling the highway you start to climb further into the forest. 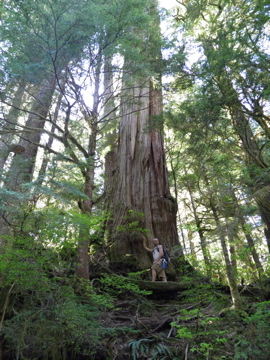 I was amazed how quickly the old growth starts on this trail! 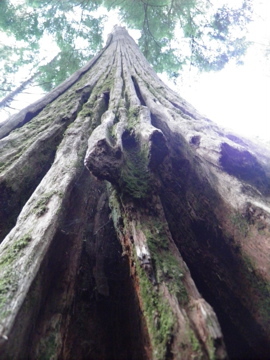 There is nothing more amazing then to be surrounded by 300-400 year old trees. I love it!!! 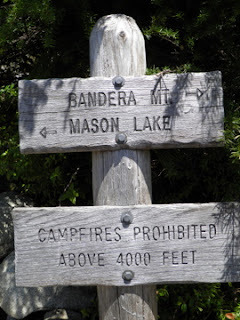 This is a fairly easy hike with an average amount of elevation which means the switchbacks are not that difficult and a total of 6 miles round trip (not counting a recommended trip around the lake). 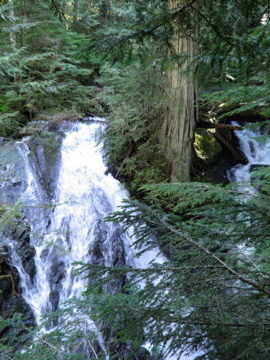 Venture off the trail at the end of various switchbacks along the trail to catch beautiful waterfalls with all their glory. 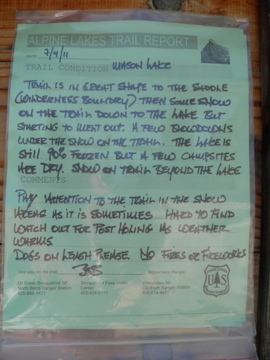 Usually, going off the trail is not a good idea and not encouraged just for the fact that too much traffic will damage the area. So, please tread lightly. 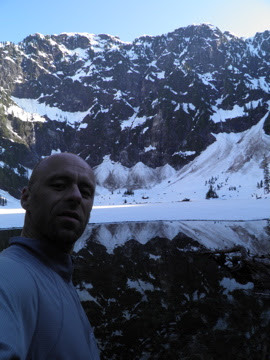 Mid to late spring makes Lake 22 a great destination because the spring melt from Mt. 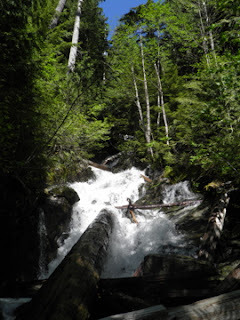 Pilchuck makes the stream and waterfalls packed to goodness with an overflow of water. 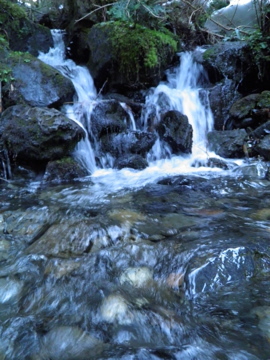 For the most part there is always the sound of flowing water in the air which makes for an even a more peaceful get away. Come back in August or September. 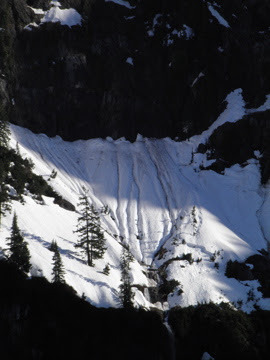 Ice caves may possibly form on the south end of the lake/north side of Mt. Pilchuck. Going at this time will make it almost a guarantee that you will be able to hike around the lake without snow hampering you getting to the south end of the lake. This is a popular hiking destination for all the above reasons so I would strongly suggest arriving early in the morning, around 8am or later in the evening around 3pm. This will allow you a little more peace with nature before the novice hikers, crowds, and dogs without leashes over run the trail. 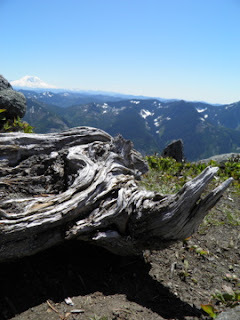 Additional photos of this hike are posted on my blog...check out my Flickr photostream! 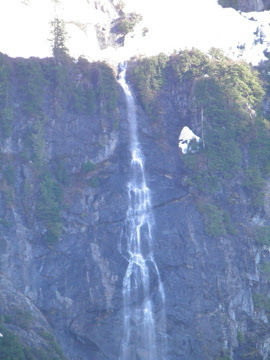 One of the first of many waterfalls. 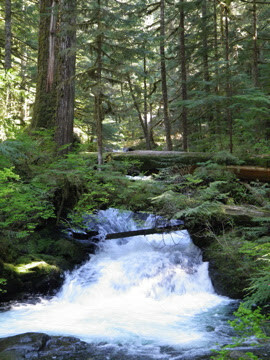 This is one of the falls that you will need to find the faint trail leading to it...but worth it! 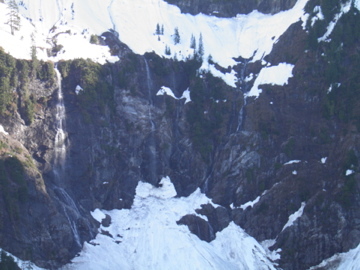 Looking north, the opposite direction of Lake 22. 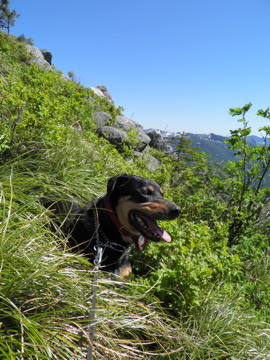 Nile loving the hike and the tranquility! 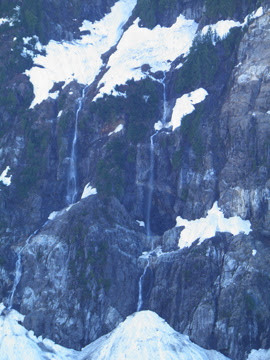 One of many waterfalls on the north face of Mt. Pilchuck. Awesome!! !